Ground floor: Open plan living/dining room (TV, CD, WiFi, A/C) with doors to terrace. Kitchen (oven, microwave, dishwasher, washing machine). Double bedroom (A/C) with en suite shower room and doors to terrace. Twin bedroom (A/C) with en suite bathroom and doors to terrace. Outside: In built barbecue. Open and covered terraces. Private parking. Private swimming pool (8m x 5m) with Roman steps. Taking its name from the famous Roman Mark Anthony, whose extensive travels took him all around the Ionian Islands (there is even an ancient stone well dating back to Roman times at the property entrance), Markandoni sits in a tranquil hillside position directly above the cosmopolitan town of Skala. Sunning itself in the heat of the day, the house is part of a widely spread out village of very stylish country properties each hidden away from the other with only the restful hum of cicadas and gentle chime of goat bells to disturb the peace. In keeping with the attractive style of Paleo Skala, a village given fresh life through the wealth of ancient ruins and tumbledown façades that have been lovingly restored, Markandoni has a very eye-catching stone exterior. Welcoming you to the property are a gated entrance and an impressive set of stone steps descending gently downhill, made private by an artful landscaping of colourful shrubs, plants and indigenous trees. 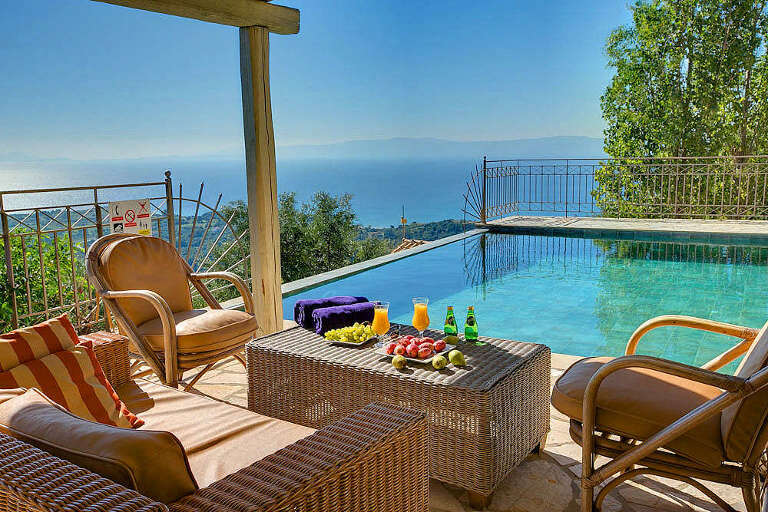 All around are wonderful views encompassing the haphazard patchwork pattern of fields and woods that comprise Skala Valley and, on the (very many) clear days, a quite marvellous panorama over the Ionian Sea to the island of Zante. Emphasising the appealing back-to-nature feel of the property is the shimmering bluish green colour of the private, infinity pool; this is not an artificial tint created by traditional swimming pool tiles but is actually plain-coloured tiles merging the reflection of the surrounding trees with the cerulean sky. Equipped with all modern amenities, Markandoni has a charming, split-level interior. The simply arranged living/dining and kitchen areas are light and airy with vaulted wooden ceilings while each bedroom has its own en suite bath or shower room. Décor throughout is a subtle blend of the contemporary and traditional with elegant furnishings complemented by rustic exposed stone walls and it is a nice touch to have all rooms opening onto the terrace to make the most of those splendid views. Handy for when an evening stroll seems just the ticket, the nearest taverna is only 500 metres away with all amenities including shops, cafes, restaurants, bars and a long sandy beach, found at Skala (4km). Half the fun of a holiday is getting out and about and there are plenty of sights to see; the numerous, blue flagged beaches such as beautiful Mounda (a 20 minute drive and home of the protected Caretta-Caretta turtles), the island capital Argostoli, picturesque northern port of Fiscardo, various museums, churches, and countless pretty villages are just a few of them! Sea front - Katelios. We stayed at Villa Markandoni and can definitely recommend the Wednesday night fish buffet at Capt Jerrys, ....swordfish, tuna , calamari, etc. Brilliant value for money too !! Yum. Most of thehouse whites on the island are great too !I Would also recommend the wine tasting of the Robola wines at the Robola winery -excellent !! It's only a 2km walk to the watermill and swallow holesof Katavothres for beautiful views and the interesting geology of the swallow hole. Reward yourself for your efforts by having a coffee or a light lunch in the watermill's taverna. Get to see the capital of Kefalonia with a marathon shop! Spend a Tuesday, Thursday or Friday in Argostoli (the only days when the shops are open in the evenings) and shop 'til you drop along the pedestrian street, Lithostroto, and round it all off with dinner amongst the locals in the main square. Take an organised day trip over to the Onassis Islands close to LefkasAs well as having a great day out, there's a more than excellent chance of spotting dolphins and porpoises. These have deservedly become a popular attraction on the island but yourarely have to wait too long for admission. We recommend that you arrive either early morning or late afternoon, so as to be sure to avoid any bus party groups that may be visiting. The stalagmites and stalactites are fantastic. Visit the Gentilini winery near to the airport. Here you can find outall about the local Robola wine, as well as sample the only Greek wine to hit the top 100 finewines of the world. Antisami - What a Beach! A great beach used as a backdrop for much of the Captain Corellimovie. Remarkably it has remained little changed over the years, still unspoilt it is difficult to get to, best to go on foot, but the scenery is worth the walk! There are many different brands of Ouzo, the most popular ones are made on the Island of Lesvos. There are also many different shapes of bottle. We recommend that you buy the one that you like the look of best,as the tastes are all fairly similar. As for the “meze” part, traditionally, this is a small platter that is made up from bits and pieces that are either left over from a previous meal, or small pieces “stolen” whilst cooking a meal for someone else! Enjoy and yammas! On the biggest festival day of the year in Greece, the festival ofSaint Maria, the most bizarre goings on take place in a village called Markopoulo. The story goes that Nuns once begged the Virgin Mary to turn them into snakes during a raid, and ever since, snakes are brought out to slither around the icons of the church in Markopoulo on this day, and many people consider this festival as a good luck festival and by touching or kissing the snakes, you are going to have a lucky year! The patron saint of Kefalonia. When his body was exhumed two years after his death in 1579, it was found not to have decomposed. Since hisdeath, many miracles have taken place in the village around the monastery, which is why he was declared a saint. No trip to Argostoli would be complete without visiting this excellentmuseum of Kefalonia's turbulent and varied past. As you may know, Kefalonia has been through many wars and under many dominions, namely the Normands, Venetians, Turks, Russians, French and the English, before becoming reunited with mother Greece back in 1864.This excellent museum takes you back through all these periods of time. The oldest monastery on Kefalonia, you have to climb a little to reach this beautiful vantage point high above Poros, but it's well worth the effort. The beaches and tavernas of Poros are waiting for you once you come back down again. This is the fabulous venue where the very first ancient Olympicswere held. You will have to take the ferry boat over to either Patras or Kylini on the mainland to visit Olympia, and although it's a long day out, it's worth it. The ferry trip itself is very pleasant indeed with plenty of sun bathing space on deck. There is an excellent established riding school located in the village ofZervata, 4km south of Sami. Their experienced team offers everything from 1-5 hours trips, to camping overnight with barbecue and campfire. this famous bridge/causeway was built back in 1813, and now that it is a car free zone, it has become a popular haunt for an evening volta(Greek terminology for an evening stroll), and perfect for adding to your photo library - as the views back towards Argostoli are wonderful. Buy a small fishing line before you go and try to catch your lunch like the locals do! (small handheld fishing lines cost only a couple of euros). as the Sun Goes Down A very romantic experience, but please be aware that it is a fairly rigorous walk up, but the views and the atmosphere at sunset are something that you will want to witness again and again. who do a grand job protecting the rare and endangered monk seal that swims in the waters around Fiscardo, as well as offering information to anyone who may be interested in the marine life of the Ionian Sea.